The partial embargo removal sends a clear signal to South China Sea rivals. 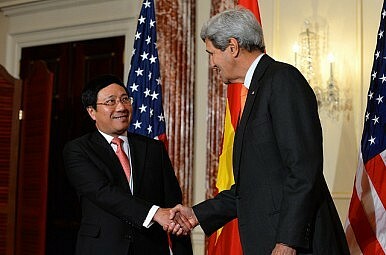 The establishment of an “implicit military partnership” between Vietnam and the U.S. has reached a critical juncture, as the U.S finally agreed to ease its lethal weapons embargo on Vietnam to improve maritime security during a recent visit to Washington by Vietnam’s Deputy Prime Minister and Foreign Minister Pham Binh Minh. This movement showed that both sides have overcome some significant obstacles in their bilateral relationship. The U.S. has long considered the lifting of its lethal weapons ban on Vietnam a sensitive issue because of the differences in political systems and values between the countries. Washington’s reluctance to end the embargo is due to claims that these weapons will be used to suppress dissidents. Such opinions are supported and lobbied by Vietnamese in the U.S., who insist that the change must be followed by political reforms. However, U.S. politicians on both sides of the isle have reacted with hesitation. There is an implicit bipartisan understanding that the lifting of the weapons embargo is a necessary strategic response to recent Chinese assertiveness in the South China Sea (SCS). Within the Vietnamese leadership, numerous critics claim that the country’s “three nos” defense policy (no military alliances, no country allowed to set up military bases on Vietnamese territory, and no reliance on any country in combating other countries) no longer benefits its national interests and sovereignty, especially after China deployed the HD-981 oil rig in Vietnam’s exclusive economic zone (EEZ). Though varying in approach and degree, these critics all try to push Vietnam closer to the U.S. From the perspective of Vietnamese strategists, only the U.S. can alter China’s SCS calculus so as to deter it from using military force to change the status-quo. Meanwhile, being backed by a great military power means a desirable change in the power balance in favor of Hanoi vis-à-vis Beijing in SCS disputes. During his trip to the U.S., Pham repeatedly avowed that Vietnamese efforts to seek U.S. weapons are “normal” and not aimed at “any third country.” However, it is clear that both Hanoi and Washington are simply playing a realist strategy. Despite this recent breakthrough, U.S. lethal weapons are unlikely to be a game-changer in the SCS balance of power in particular, and in Sino-Vietnamese-U.S. trilateral relations in general. First, even a complete lifting of the U.S. weapons embargo on Vietnam would not transform the balance of power between China and Vietnam in any significant way. The Chinese People’s Liberation Army Navy will still massively outnumber its Vietnamese counterpart. The Chinese fleet is also more modern and better equipped. Since U.S. weapons are very expensive, Hanoi could not realistically afford enough of them to meaningfully alter its current military structure in order to effectively deter a Chinese threat. Even in a scenario where Vietnam could afford significant quantities of U.S. arms, it would take years for the People’s Army of Vietnam to integrate U.S weapons into its system, which has been dominated by Russian weapons for decades. More importantly, significant misperceptions and differences persist between both countries in defense cooperation. On Vietnam’s side, it wants defense cooperation that goes beyond arms sales. Ideally, there would be joint maritime patrols between the U.S. and Vietnamese navies and a more robust U.S. commitment to ensuring maritime security and stability in the SCS in the event of Chinese aggression. An implicit but firm U.S. pledge to assist and defend Vietnam in case China attacks first would also be beneficial for Vietnam, and would not publicly violate the “three nos” defense policy. However, these are undertakings that the U.S would be reluctant to agree to, given its defense budget sequestration, its military commitments elsewhere, and its unwillingness to overtly confront China. Nonetheless, there are some in Vietnam who are hopeful that the U.S. might soon provide assistance in maritime patrols. The partial lifting of the U.S.’s lethal weapons embargo is a crucial starting point for more robust defense cooperation. However, it seems to fall short of expectations on both sides, especially as a check on Chinese expansionist ambitions in the SCS. Although hardly a game changer, the recent breakthrough is still politically and symbolically significant, and therefore acceptable to both sides for now. Truong-Minh Vu is a foreign affairs and political analyst focusing on the Southeast Asian region, and a lecturer at the University of Social Sciences and Humanities, Ho Chi Minh City, Vietnam. Ngo Di Lan is a foreign affairs analyst in Maastricht (The Netherlands). The opinions expressed in this article are the authors’ own. A Tipping Point in the US-China-Vietnam TriangleVietnam Launches Legal Challenge Against China’s South China Sea ClaimsStrategic Trust, an Oil Rig and Vietnam’s Dilemma Vietnam Steers Between China's Threat and Public's AngerCould Vietnam Have Avoided the 1979 War With China?